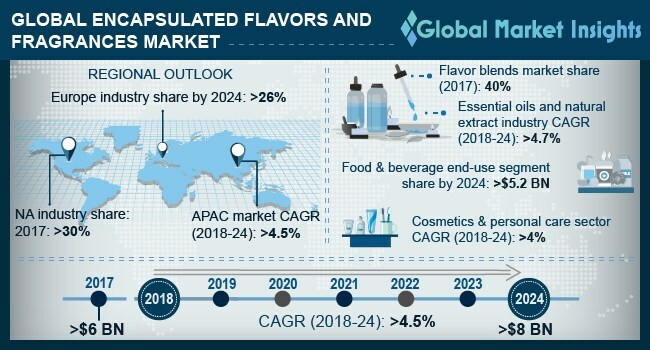 Global Encapsulated Flavors and Fragrances Market size is estimated to exceed USD 8 billion by 2024; according to a new research report by Global Market Insights, Inc.
Increasing product demand from personal care & cosmetics products such as shampoos, anti-aging products, soaps and creams will drive the overall market share. In addition, rising demand for authentic and recognizable essences in various end user industries, including dairy & frozen products will supplement the business growth. Growing financial support from the government for research and development will further boost the market growth. Food & beverages segment is expected to be valued over USD 5.2 billion by 2024. Increasing population along with rising disposable income of consumers has enhanced the product penetration. Growing usage of ready to eat food due to the busy schedule of the people will positively support the revenue generation. Europe encapsulated flavors and fragrances market is anticipated to witness revenue share of over 26% by 2024. The regional growth can be credited to the changing lifestyle of the people coupled with increasing inclination towards fast food.